As I try to reflect on 2015, I’m at a bit of a loss for words. In the grand scheme of things, it’s been one helluva year. I got hitched on a back screen porch in the rain and I had a baby. I said goodbye to our beloved kitty and hello to a new one. I took time away from one career while trying to spark a new one. But throughout it all there’s been food, for which I am grateful. I pickled carrots. I made lots of smoothies. I ate lots of ice cream. There were tacos, salads, pizzas, beans, loaves of bread and bowls of soup. I’m not one for making resolutions, but there is usually a list- in my head or written down- of things “to do.” This year I will try to play more banjo, exercise everyday (more for my own peace of mind than anything else), widdle down the t-shirt collection, spend more time reading and writing and less time aimlessly wandering the internet and eat more lentils. I referenced this soup in another post recently, but it’s so good I thought I should include the recipe. I recommend that you double the amount of tomato paste and lemon juice. You can also add more lentils and liquid if you want to stretch it out for a couple of meals. Maybe add a salad and a loaf a good bread. Definitely a bowl of ice cream for dessert. In a large pot, heat 3 tablespoons oil over high heat until hot and shimmering. Add onion and garlic, and sauté until golden, about 4 minutes. Stir in tomato paste, cumin, salt, black pepper and chili powder or cayenne, and sauté for 2 minutes longer. Cheers to a happy 2016. This morning a steady mist of rain spread out over the farm as I crouched in the mud snapping collard greens off their stalks. In jeans, a sweatshirt and a rain coat I felt cozy as the temperatures barely hit 60. As much as I love summer, I don’t mind the occasional cool, rainy day; they remind of summer camp- hunkering down in the lodge, a chance to don a sweater, a change of pace. Moving on to pull weeds from the winter squash, my mind wandered to soup. Making a deliciously simple potato soup for lunch is something that my mother pulls off on a regular basis, regardless the season. I think it is something that she inherited from her parents. When I picture my grandpa, it is often at the stove. Either the small gas one that sits in front of the brick-lined kitchen wall of the northwest Iowa cottage or the one sixty miles away at his home where I could hand-crank the bell on the door that led inside to the kitchen, announcing my arrival. At the cottage he popped his homegrown corn to perfection; at home he stirred his award-winning fudge. But I think he loved potatoes the most. To make a simple potato soup, cut up some potatoes and put them in a pot with just enough water to cover. Gently boil until the potatoes are cooked and most of the liquid is absorbed. Mash up the potatoes to the desired consistency and add milk, butter, salt and pepper. Mine never tastes as good as my mom’s. After returning home from the farm today I wanted to make an Iowa-inspired potato soup for lunch, but I have turnips haunting me from my crisper drawer and garlic scapes curled-up, hovering on the bottom shelf waiting for something extraordinary to happen to them. 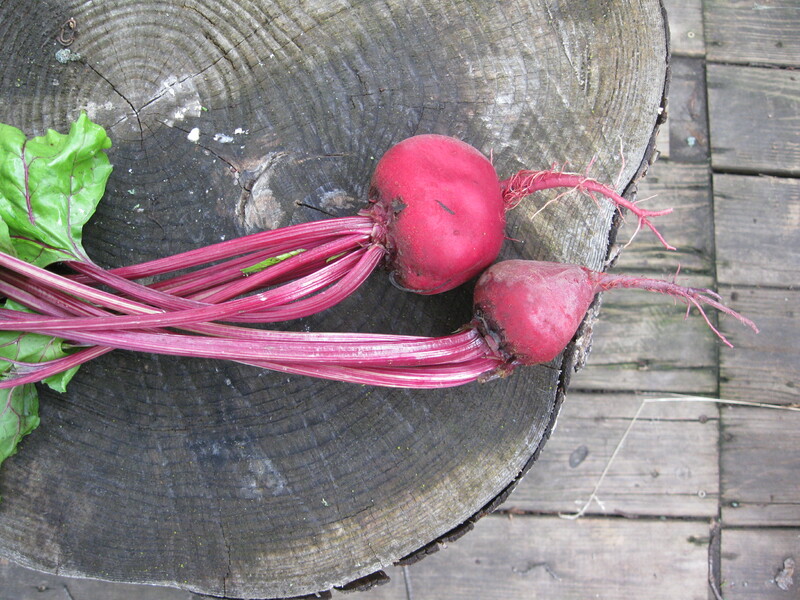 I also took home two beets today from the farm, deemed “farmer food” due to the fact that some worms also wanted a few bites, so into the pot they go. And don’t forget the neglected leek, long forgotten under kale and lettuces. So I chopped up turnips, a couple of potatoes and beets and added them to leeks and garlic scapes sauteed in olive oil and butter. I added dill and red pepper flakes. Right before serving I blended it all up, added salt, pepper, a drizzle of olive oil and a squeeze of lemon. As the vegetables simmered on the stove, I sauteed more garlic scapes, dill and chives in olive oil and made herbed croutons from the 1/2 eaten loaf of sourdough bread leftover from my lunch a few days ago. 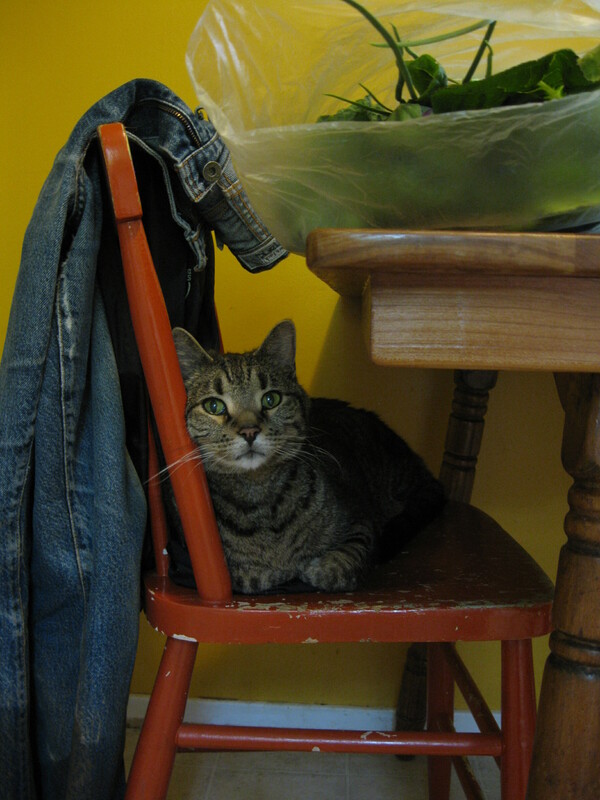 Danger Boy watched the whole thing, perched under my muddy jeans and garlic scapes. Please use the following recipe as a guide- I don’t have a tendency to measure things- and adjust it to whatever vegetables are haunting you. In a large soup pot heat the olive oil and butter over medium heat. Add the leek and scapes and saute for a few minutes. Add the root vegetables and herbs and cook for a couple of minutes. Add the liquid to the pot and bring to a boil. Reduce the heat and simmer for 25-30 minutes. Meanwhile, preheat the oven to 325 degrees. Rip the bread into bite-sized pieces. In a skillet, saute the fresh herbs in the olive oil. Remove from the heat and add the bread, tossing to coat. Pour the bread onto a baking sheet, making sure to spread the pieces out. Bake for 15 minutes, stirring occasionaly. When the vegetables in the soup are tender, blend it with an immersion blender until smooth. Add fresh herbs and as much lemon juice as you like (I like a lot, Dan likes a little, so I add more to my own bowl). Add salt and pepper to taste. Ladle into bowls and garnish with a pour of olive oil, more dill and herbed croutons. Cultivating and cooking are in our bones. This soup will warm yours. And just like that, this is post number 100 for Wisconsin Fun Next Exit. Over the past couple of years I have truly enjoyed writing here- in this tiny space of the atmosphere- and I hope you have liked it, too. While I may not tell you enough, I am always thinking about you. I hope that you have found something that made you laugh or think or want to get your buns into the kitchen. It makes me infinitely happy that that is a possibility. Now I’m not trying to tell you what to do, but lately I’ve been spending weekend mornings listening to 1970s Rod Stewart on the record player and cooking eggs. 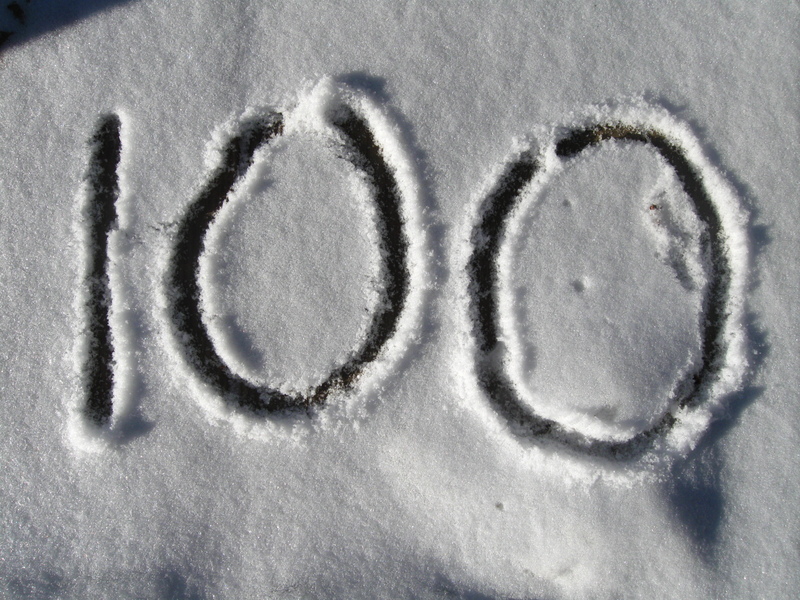 And because this is my 100th post, you just might want to listen to me. A couple of weeks ago I told you about eggs in purgatory. This morning I adapted an idea from Heidi Swanson (she calls it sun toast) and made eggs in Wisconsin: Melt a hunk of butter in a skillet over medium-low heat. 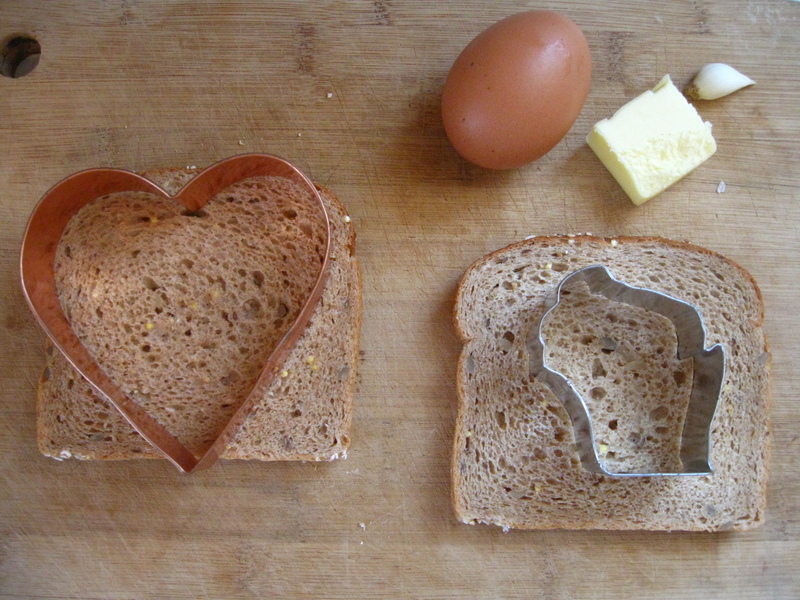 Take a round cookie cutter (or a Wisconsin one, if that suits your fancy/ is all you have) and cut a shape out of the middle of a piece of bread. Put the bread (both parts) into the skillet and toast both sides. Next, carefully crack an egg into the hole. Flip it with a spatula and cook the egg to your liking. Just before serving rub a garlic clove all over the toast. Or, if you are Dan, skip the garlic and grate sharp white cheddar all over the darn thing. A salad of arugula and olive oil is nice on the side. And coffee. Keep it coming. If you are up for a little bit more flavor and punch, my other suggestion is to make ranchero breakfast tostadas, from my new cookbook, The Sprouted Kitchen. 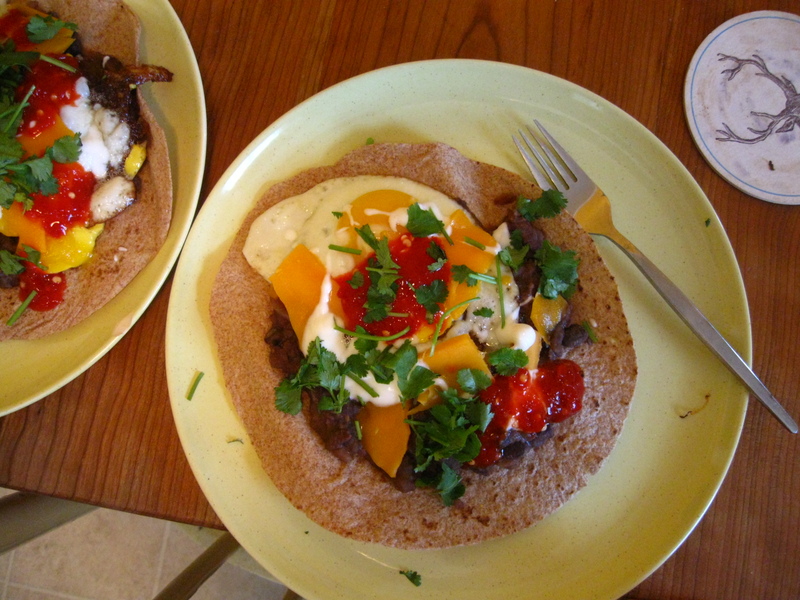 These are easily adapted to what you have in the fridge- I used whole yogurt instead of sour cream, a yellow onion instead of green and whole wheat flour tortillas in place of corn. They were delicious all the same. Preheat the oven to 400 degrees. Warm the beans in a saucepan (if using a new can, drain them first) over low heat. Add a little luke warm water, the yogurt, onions, cumin, salt and red pepper flakes and mash them up a little with a fork. Turn off the heat, but cover to keep warm. Fry the eggs in butter, olive oil or coconut oil. Meanwhile, place the tortillas in the heated oven until they become a little crisp. Assemble the tostada by topping a tortilla with 1/2 of the bean mash, an egg, avocado slices, shredded cheese, yogurt, cilantro, hot sauce and a squeeze of lime. It’s above twenty degrees and I’m off for a run. But be on the lookout- Dan and I have a surprise up our sleeves. A new corner of the universe where we will share the things that make us happy. Until then, thank you for reading. 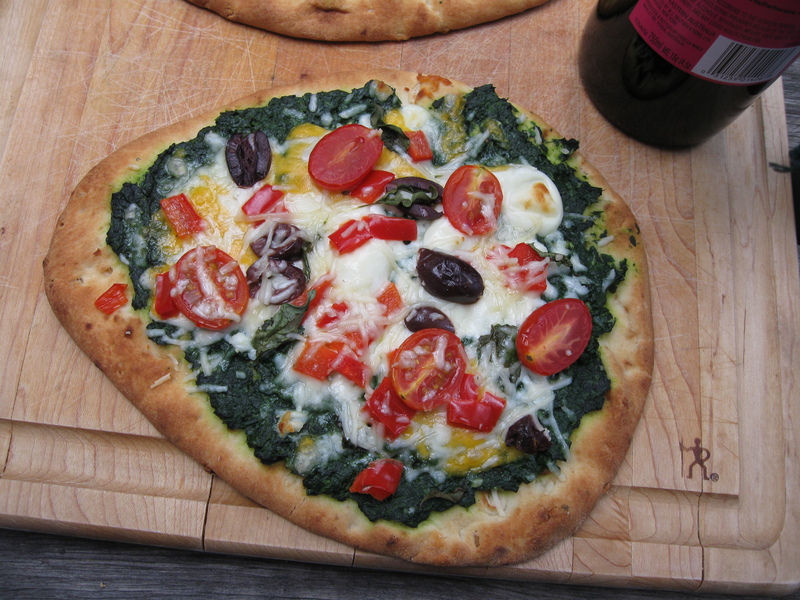 A love triangle with a new twist: Homemade whole wheat pizza crust. When you are ready to make a pizza, preheat oven to 500°F roll out one ball of dough in a rectangular shape and place on an oiled cookie sheet. *I skipped the step of dividing the dough and found that it makes a perfect amount for one cookie sheet (one pizza). And while this pizza is supposed to serve 5, Dan and I can take it down, just the two of us. Top the pizza with your favorite ingredients and cook at 500 degrees for about 15 minutes. When I first made this a couple of weeks ago I had bought a bunch of arugula from Harmony Valley at the downtown Madison farmer’s market with hopes of recreating a pizza I had in Chicago last winter: a spicy arugula salad with lemon and shaved parmesan topped a thin crust pie. Heaven. So I improvised a recipe that I found on Dinner a Love Story. I topped the crust with tomato sauce and slices of Cesar’s mozzerella and baked it for 15 minutes. When it came out of the oven I dressed the pizza with a salad of arugula, lemon, olive oil and parmesan cheese. It was love at first bite. Two Tuesday nights ago I sat at my kitchen table in utter disbelief that people could see the world in a way that is so vehemently different than how I see it. I grew up in a place that valued public education, the outdoors, compromise. Now all of that has seemed to change. As I try to negotiate my way through this different world, I can’t help but think that this change has a lot to do with money. And I have never understood money. So this could be my problem, or it might just be my saving grace. In the midst of what may seem like a referendum on the life you have chosen for yourself, you must return to the things that bring you happiness. Cooking, digging in the dirt, swooning over pets, bike rides, and cauliflower. With salsa verde. I made this cauliflower a month and a half of Tuesdays ago on my birthday. My parents joined us for cocktail hour and the cauliflower, with its zingy sidekick, was a hit. Prepare the salsa verde first. In a medium bowl, combine the jalepeño, cilantro, garlic, lime juice and olive oil and whisk to combine. Add salt to taste and whisk well. Set aside at room temperature for at least 30 minutes. Put the cauliflower in a large bowl and toss with 2 tablespoons olive oil, making sure to coat all the pieces. Spread cauliflower in a single layer on a large heavy sheet pan. Salt it lightly. Bake until the cauliflower is tender, golden and evenly browned in spots, 20-30 minutes, turning occasionally with a spatula. 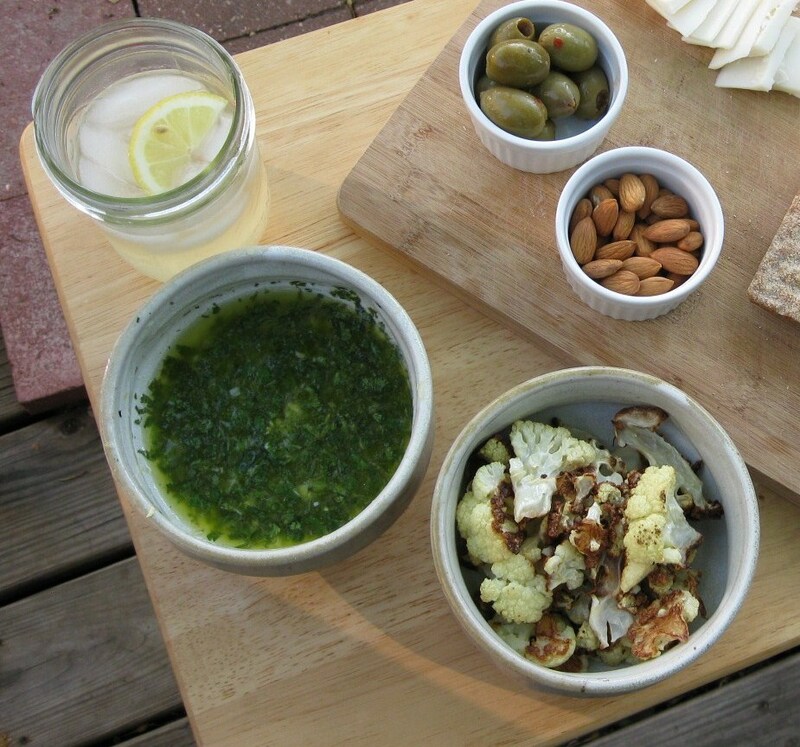 Serve cauliflower hot or warm, with salsa verde on the side for drizzling (or dipping!). On this Tuesday night, invite some friends and make them this cauliflower. Sit outside and toast to your saving grace. My tastes eventually matured, and as a student at the UW, in an effort to ward off college-induced scurvy, I would occasionally purchase a piece of fruit from the wooden stand parked in Library Mall. Fast forward to the last few years and my sister’s discovery of the most delicious gazpacho from the Santa Fe Trailer, usually available on the summer festival circuit. It’s so good, it should be added to this list. All of this brings me to a gorgeous Friday evening in May spent in Olin Park with my other best friend, Ryan (there you go, Ryan, it’s in writing for the world to see) and 498 other Madisonians eager to check out the city’s inaugural food cart festival, Isthmus a la Carts. We arrived at Olin Park around 6, just as the sun was beginning to hang lower in the sky, giving the tall grasses that happy hour glow, and made a beeline for Banzo (well, first beer, then Banzo). 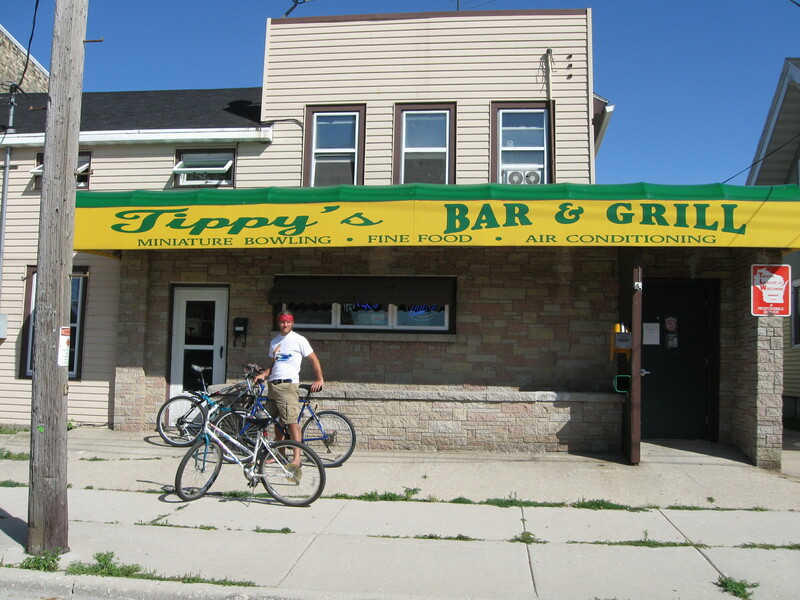 I was eager to try the falafel and hummus that I had been hearing so much about through the Madison grapevine. And it was worth the hype. The crispy, warm falafel was brown on the outside, green on the inside and perfect with the tahini sauce and optional hot sauce (I opted, and you should too.) The hummus sampler was tasty as well. I am excited for summer when I can make the trek to the cart for a full-size falafel extravaganza. 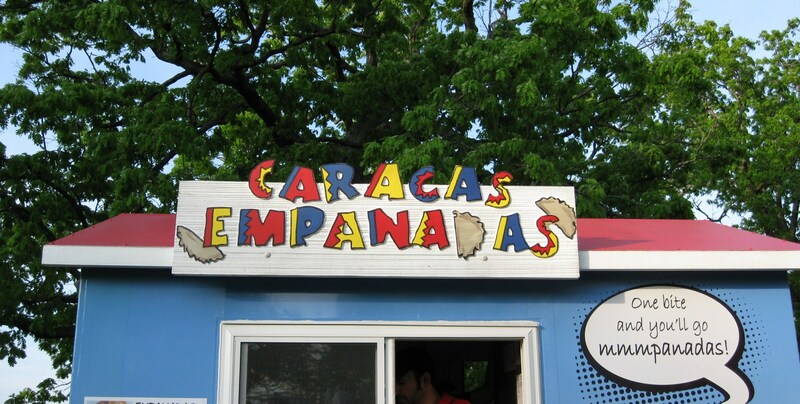 After eating falafel, drinking beer and catching up from our perch on the hill, Ryan and I mozied next to Caracas Empanadas for homemade empanadas. Meat eaters were out of luck, but I was not. 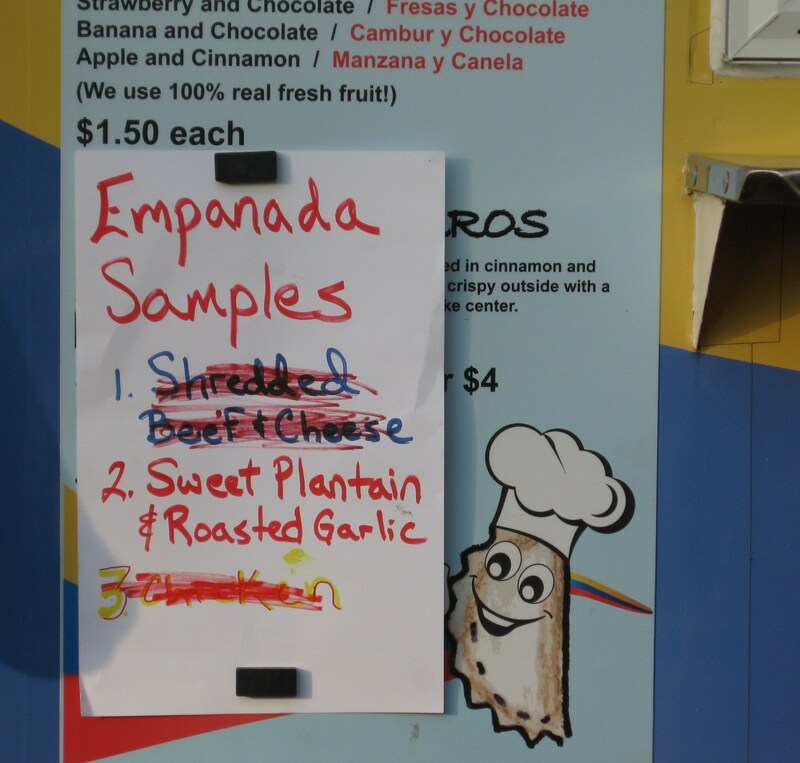 The sweet plantain and roasted garlic empanadas, with a shot of cilantro sauce on the side, were where it was at. The crust melted in my mouth, melding sweet flavors of plantain and garlic, enlivened by the refreshing cilantro. Oh yeah. From there, things get a little hazy. There were samples of veggie burgers and tofu with rice, Ryan had sausages, I had more beer. 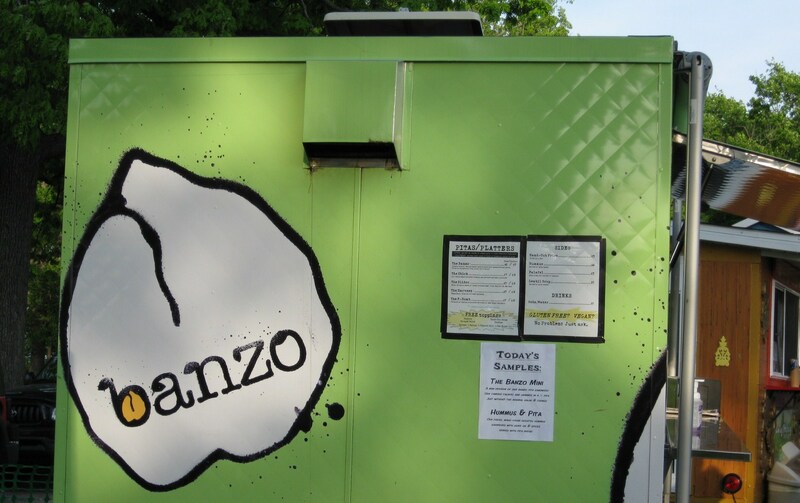 For dessert, Ryan sampled deep fried oreos, but with no Hawaiian Ice truck in sight, I made my way back down the hill to Banzo for my nightcap. *Don’t be the last to know about cucumber luges… post coming soon.